Peabody Cider Mill. Seen at railroad crossing two shingled buildings with trees. Dirt Road. Cider Mill in photograph could be in one of two locations, The Corner of Lowell and Newbury or the corner of Lowell and Prospect Street (Proctor's Crossing). 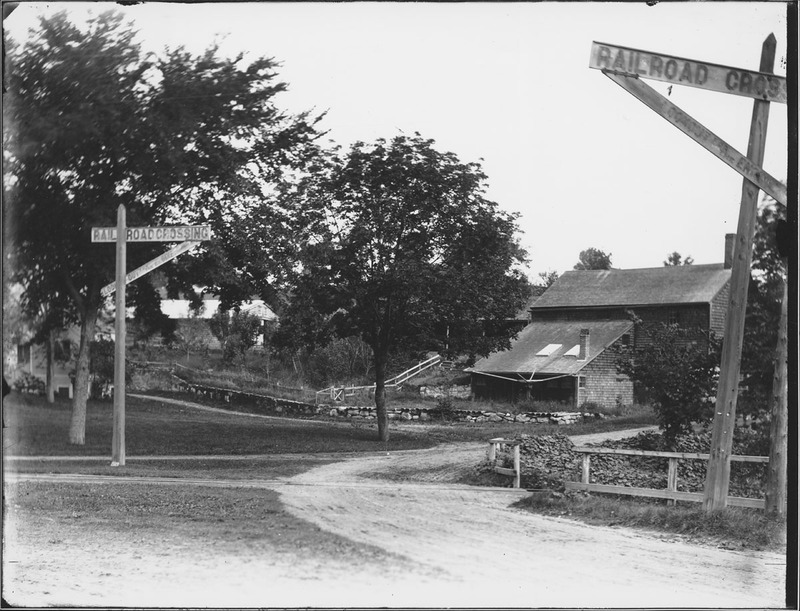 The Cider Mill at the corner of Lowell and Newbury was owned by Joseph S. Needham. The Mill at Proctor's Crossing was owned by Charles S. Emmerton in 1888-9 or by Augustine L. Babbidge in 1899. Both were near railroad tracks. “Cider Mill,” Peabody Institute Library, Peabody, Mass., accessed April 18, 2019, https://digitalheritage.noblenet.org/peabody/items/show/192.